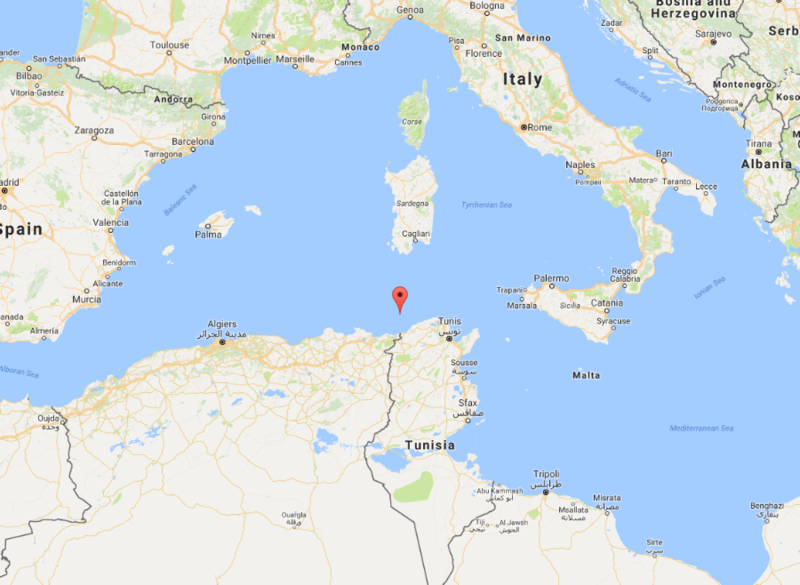 1961 sank off Tunisia; loss of 62 lives. In the matter of a Formal Investigation held at 29 Lincoln's Inn Fields, London, W.C.2., on the 7th, 8th and 9th days of May, 1962 before Waldo Porges, Esq., Q.C., assisted by Captain J. E. Cooper, O.B.E., Captain H. A. Shaw, O.B.E., A.R.I.N.A. and Dr. E. C. B. Corlett, M.A., Ph.D., M.R.I.N.A., into the circumstances attending the loss on the 5th November, 1961, of the British steamship "Clan Keith" in the Mediterranean, as a result of which 62 members of her crew lost their lives. The Court having carefully inquired into the circumstances attending the above-mentioned shipping casualty, finds for the reasons stated in the Annex hereto, that the "Clan Keith" broke in half as a result of striking the Ecueils des Sorelles Rocks and that her consequent loss and the resulting loss of 62 lives were caused or contributed to by the wrongful act or default of her master, Leslie George William Pitts, and the Court suspends his master's certificate for eighteen months from today. The Court further orders the said Leslie George William Pitts to pay the sum of £100 to the Treasury Solicitor on account of the expenses of the Investigation. Dated this 25th day of May, 1962. 1. This Inquiry was held at 29 Lincoln's Inn Fields, London, W.C.2, on the 7th, 8th and 9th May, 1962. The Minister of Transport was represented by Mr. Barry Sheen and Mr. G. F. Horton (instructed by the Treasury Solicitor). The following were parties to the Inquiry with representation as stated: the owners of the "Clan Keith", Clan Line Steamers Limited and the designated manager, Mr. William Laurence Woof, represented by Mr. Roland Adams, Q.C., and Mr. G. Darling (instructed by Messrs. Coward Chance & Company); the master of the "Clan Keith", Captain Leslie George William Pitts, represented by Mr. J. D. Rochford (instructed by Messrs. Hill, Dickenson & Company); the next of kin of Mr. G. Lynch, the chief officer, Mr. R. W. Lafford, the third officer, Mr. Pattie, the radio officer and Mr. S. A. Hardy, apprentice, represented by Mr. R. F. Stone (instructed by Messrs Ingledew, Brown, Bennison & Garrett); Mr. Winter (Father of Cadet Winter, deceased) who applied to be made a party at the hearing. Mr. R. F. Stone, also held a watching brief for the second officer, Mr. Michael Jackson, the second engineer, Mr. Harry Adams, and the third engineer, Mr. Alexander Forbes Troup Connor. Mr. Derek Hene (instructed by Messrs. Parker, Garrett & Company), held a watching brief for Lloyd's Register of Shipping. 2. The "Clan Keith" was a steel single screw Ocean class cargo vessel, having two decks, and was built in 1942 by the Todd California Shipbuilding Corporation, Richmond, California, U.S.A. She was of all welded construction with transverse framing throughout. Subsequently longitudinal stiffening was fitted to the bottom shell and underside of tank top and riveted crack arrestors were fitted to the sheer strake port and starboard. The ship was converted to oil burning and No. 3 hold was originally the coal cross bunker. No modifications were made to the original design of hatch corners. The registered dimensions were 425.1 ft. x 57.0 feet x 37.4 feet. After peak tank and crew accommodation. The propelling machinery was oil fired and consisted of a direct acting, surface condensing triple expansion engine driving a single screw, supplied with steam by three Scotch type marine boilers having a loaded pressure of 220 lbs. per square inch. The estimated speed of the ship was eleven knots. The engines were made in 1942 by Hoover-Owens Rentschler, Hamilton, Ohio, U.S.A. and the boilers in 1942 by the American Locomotive Company, Schenectady, New York, U.S.A.
All pumps serving the bilge and ballast pumping systems provided for pumping from water-tight spaces in the hull were situated in the machinery space. The bilge pump comprised a steam driven ballast pump of approximately 200 tons per hour capacity; a steam driven general service pump of approximately 30 tons and two ram pumps driven by the main engine. The steam driven independent main condenser circulating water pump of approximately 816 tons per hour capacity was fitted with a 10 inch diameter emergency bilge suction ("bilge injection") serving the machinery space only. The main steering gear, made by Sumner Iron Works, Everett, Washington, U.S.A., was driven by a vertical steam engine. The emergency steering gear consisted of blocks and tackles led to the after warping winch. The "Clan Keith" was provided with complete sets of oil and electric navigation lanterns and was fitted with a steam organ type whistle. The vessel held a Safety Equipment Certificate covering these items issued at Cape Town on 11th July, 1961 by the Government of the Republic of South Africa at the request of H.M. Government. The certificate remained valid until 10th July, 1963. The vessel was equipped with a spirit standard compass on monkey island. A similar compass was fitted at the main steering position in the wheelhouse and an additional compass at the emergency steering position aft. The compasses were last adjusted on 22nd August, 1957. One 30 foot wooden lifeboat for 60 persons (No. 3). No's 1 and 2 boats were stowed under prefabricated tubular luffing davits, and No's 3 and 4 boats under Crescent type luffing davits. All lifeboats were handled by rope falls. Seventy-four Victory type kapok lifejackets. One Schermuly 'Supreme' line throwing appliance. One inflatable liferaft for twenty persons. The life saving appliances were covered by the Safety Equipment Certificate issued at Cape Town on 11th July, 1961, by the Government of the Republic of South Africa, at the request of H.M. Government. The certificate was valid until 10th July, 1963. The inflatable liferaft was last serviced on 9th March, 1960. Main Transmitter. Marconi Oceanspan Receiver Type C R300/20. Emergency Transmitter. Marconi Salvor Receiver, Marconi-Alert. Lifeboat Portable Transmitter. I.M.R. Solas. The ship was also fitted with an automatic keying device. Radar. Quo Vadis, Type 1418 A. Direction Finder. Marconi Type 579. Echo Sounder. S. G. Brown Ltd. Type 655. Other Sounding Appliances, logs, etc. Deep sea sounding machine. Sceptre. Two hand leads complete with lines. Three patent logs. Cherub Taffrail. The "Clan Keith" was classed 100 A1 with Lloyd's Register of Shipping. The last special survey in this connection was held at Glasgow between 23rd January, 1959 and 12th February, 1959. The most recent survey in dry dock was held in Rotterdam on 6th October, 1961. "Clan Keith" also had the Lloyd's Register Classification L.M.C. (Lloyd's Machinery Certificate). The vessel held an International Load Line Certificate issued in London on 6th February, 1959 by Lloyd's Register of Shipping under the authority of H.M. Government. The last annual survey in this connection was held at Glasgow on 10th January, 1961. Freon 12 plant made by Carrier Corporation of U.S.A. designed to use Freon gas that in actual use at the time of the casualty being the British equivalent Arcton 6 an inert gas. 3. The "Clan Keith" left Southampton on the 28th October, 1961, bound for Malta and thence further east, carrying a general cargo, including some livestock. She was under the command of her master, Captain Pitts and, in addition, carried a crew of 13 European officers and 54 Pakistani seamen. Her draught on sailing was 20 feet 2 inches forward and 23 feet 11 inches aft. She was well found and fully provided with life saving equipment. 4. Early on the morning of the 5th November, during the second officer's watch, the "Clan Keith", which was proceeding in an easterly direction. reached a position with Cape de Fer light distant six miles and bearing 168°. The wind was then northwesterly of gale force and the vessel took a heavy sea which shifted the horse boxes and disturbed some deck cargo and also lifted the No. 4 lifeboat and holed it. The lifeboat was lashed down and plugged and the master decided to alter course to 026° to bring the wind and sea forward of the port beam and he also reduced speed. About two hours later the vessel was brought on to a northerly heading and her speed was further reduced. At about noon an easterly course was set for a position 10 miles north of Galitons de l'Ouest. The position of the "Clan Keith" when this course was set was estimated by dead reckoning to be Lat. 37° 35' N. and Long. 7° 11' E. The speed was then increased to about 9 1/2 knots. It was intended to make good a course of 86° true, but the Court is left in doubt as to what, if any, allowance was made for leeway or compass error. At 16.00 hours the second officer, just before handing over the watch to the chief officer, laid off a dead reckoning position on the chart. The second officer gave evidence before the Court, but did not recollect this dead reckoning position. He said, however, that he expected that the vessel would reach a position from which the Galitons de l'Ouest light could be picked up at about 18.00 hours. At about 18.00 hours the second officer had dinner with the chief officer, who had been relieved by the third officer, and, shortly thereafter, at a time which cannot be identified, the third officer told the second officer that he had sighted the Galitons de l'Ouest light on the port bow. 5. The master told the Court that, at about 18.30 hours after finishing his dinner, he left his cabin and went to the chart room expecting that the Galitons light and islands would be seen. The chief officer joined him in the chart room and reported that the Galitons light had been picked up. The master instructed him to get a bearing and put the position on the chart. The chief officer laid off the position on the chart and said "The island is 26 miles off", but did not report the bearing. The master said that he looked at the position laid off on the chart, but did not check it. He said that he looked at the radar and saw what he thought to be the echoes of two islands outside the last range ring on the screen. They were bearing slightly on the port bow of the "Clan Keith" which he thought was then heading about 80° true. Realising that his vessel, which was making for a position 10 miles north of Galitons de l'Ouest, was very considerably to the southward of her intended position, the master decided to alter course to starboard. He therefore marked on the chart a position 3 1/2 miles to the westward of the Ecueils des Sorelles buoy. He said that this position was on a bearing 125° from the position previously laid off by the chief officer and that he, therefore, set a course of 125° at 18.35 hours. 6. About 10 minutes later the light of the Ecueils des Sorelles buoy is said by the master to have been sighted 3 to 4 points on the port bow. Shortly afterwards he went below, giving orders to be called when the light was abeam. At about 19.10 hours the master felt the ship shudder and heard a noise. He went up to the bridge and, very shortly afterwards realised that the vessel had broken in two. 7. In evidence the master told the Court that he was now convinced that the vessel had struck the Ecueils des Sorelles rocks. He also said that he had previously in a deposition on oath, deliberately invented a radar observation which had never in fact been obtained, with the object of showing that his vessel could not have struck these rocks. On being rescued by the motor vessel "Durham Trader" on the morning of the 6th November he told her master that a terrific explosion, similar to a mine explosion had occurred on the "Clan Keith" and that she had then broken in half. On the 14th November, however, he stated on oath that, other than the background noise of wind and weather, he had heard no significant sound. On the 30th November, in a further deposition on oath, he stated that contrary to reports made by him, or attributed to him, he did not believe that any explosion either internal or external had occurred and that the loss of the vessel could not be attributed to any such explosion. On the 8th December, he further deposed that, in his considered opinion, the "Clan Keith" broke in two through striking the Ecueils des Sorelles rocks and that he did not now believe that the light sighted on the port bow after the vessel had altered course to 125°, was the Ecueils des Sorelles buoy unless that buoy was out of position. The Court does not accept the master's evidence that he ever saw any light 3 to 4 points on the port bow whilst the vessel was on the 125° course. 8. In addition to the above mentioned instances the master had made several other important alterations in his story from time to time and, in the absence of any other contemporary evidence, exhaustive enquiries were made so as to leave no available avenue unexplored. The Court is satisfied on the evidence adduced that the Ecueils des Sorelles buoy was in fact lighted and in its proper position at the material time. It is also established beyond doubt that no explosion, either internal or external, in fact occurred. Expert evidence further established that, in the weather conditions which prevailed, and taking into account her age and the details of her construction, it is most unlikely that the vessel broke solely due to stress of weather. 9. Every effort has been made by the Court and others concerned in this Investigation to establish with some accuracy the probable track of the "Clan Keith" up to the time when she broke up. This task has been made exceptionally difficult by vacillations in the master's story. In his deposition on oath of the 30th November, for example, the following passage occurs: I wish to state categorically that I am satisfied that the bearing taken and the radar range was of the Galitons de l'Ouest island and lighthouse and no other. This island from our position stood out clearly and unmistakably from the adjacent islands and there is no possibility of a mistake either in bearing or range". On the 8th December he deposed, "I now have reason to believe that this range was not taken from the Galitons de l'Ouest, but that what was taken would be the high points of the background island of Galita". On the 30th November he said: "At 18.50 both the chief officer and I sighted the buoy as expected, bearing 3 to 4 points on our port bow and at the same time a radar range of Galitons light placed us 22 miles from the light, and by plotting on the chart, six miles from the Ecueils des Sorelles buoy". On the 8th December he stated: I wish at this point to retract my earlier statement that a second radar range of 22 miles was observed. No such bearing or range was in fact taken". Further difficulties were created by the master's evidence that the maximum range on the vessel's radar set was 30 miles, whereas other evidence clearly establishes that it was, in fact, 40 miles. 10. After careful consideration the Court has no doubt that the "Clan Keith" in fact, broke in half at a point between the Nos. 3 and 3A hatchways as a result of striking the Ecueils des Sorelles rocks. 11. After the vessel had broken in two nine persons, including the master, were left on the forward part. The radio aerials had parted and no signals could therefore be transmitted on the main or emergency sets. No signals were sent out on the lifeboat portable transmitter before it was transferred to the No. 2 lifeboat and no satisfactory explanation has been put forward for this omission. Whilst the No. 2 boat was being lowered this transmitter was lost overboard and, consequently, no radio signal was ever sent out. No distress rockets were fired. The No. 2 lifeboat was successfully launched with 2 persons in it and they were subsequently joined by the chief steward. It could not, however, be prevented from drifting away and the remaining 6 persons on the forward part, including the master and chief officer, then launched the inflatable life raft. The raft subsequently became holed probably by contact with the jagged edge of the forward part of the vessel. The master was thrown from the raft as it worked in the sea way and those in the No. 2 boat were able to pick him up. Later, after attempts had been made to row the boat towards it, the raft disappeared and its remaining five occupants were lost. Those in the No. 2 lifeboat let off flares and rockets during the night and were rescued by the "Durham Trader" at about 06.00 hours on the 6th November. The forward part of the "Clan Keith" sank at about 08.05 hours on the 6th November in a position about 7 miles west of Cape Serrat. 12. When the vessel broke there were 59 persons on the after part, but no deck officers other than one cadet. No instruments were broken in the engine room, and there were no signs of any explosion having occurred. The second engineer who was on watch displayed commendable presence of mind and initiative throughout. He immediately stopped the transfer pump and started the condenser pump, in anticipation of receiving an order to stop the engines. It was then reported to him that water was entering the stokehold and he started the ballast pump and endeavoured to ring the bridge. He then rang the bell to summon the rest of the engine room staff. On his orders the door to the tunnel was closed and he then decided to go up and report to the bridge. He found that the vessel had broken in two and returned to the engine room, stopped the engines and ordered the main condenser circulating pump to be put on the bilge injection. He also told those in the engine room to go to the boats. He then went to the damaged No. 4 boat on the port side, which was his boat station, and, with three others began to prepare it for launching. Shortly afterwards however, he was informed that the rest of the crew who were all on the starboard side were having some difficulty in launching the No. 3 boat as the forward davit had jammed. He then went to the starboard side and assisted in clearing the davit and, when the boat was swung out, he returned to the port boat to collect some rockets. He put three rockets in his pockets and on returning to the starboard side, could see no trace of the No. 3 boat. 13. Whilst the No. 3 boat was being lowered, its forward part fell away and it was left swinging on the after falls for a time before it fell way altogether. Of about 50 persons who had been in the boat and were thrown out when it was being lowered only about 6 or 7 succeeded in regaining it after it finally reached the water. It had probably been damaged whilst swinging against the vessel's side and rapidly became water logged. During the night the number of persons in the boat was reduced to three and, at some time thereafter, the boat turned over. Of these three, two were able to hold on to the grablines of the boat until they were picked up later on the morning of the 6th November by the Finnish tanker "Nunnalahti". Only one of these two persons, the third engineer, survived the ordeal. 14. After the No. 3 lifeboat had been lowered, nine persons, including the chief engineer and second engineer were left on the after part. During the night unsuccessful attempts were made to attract the attention of passing vessels by means of rockets and torch signals. At about 22.30 hours on the 5th November the after part began to sink and the damaged No. 4 lifeboat was let go. Attempts were made to free the horses in the horse boxes on the after deck, but within a few minutes, the second engineer, who was washed overboard, saw that water was a quarter way up from the base of the funnel. Shortly afterwards, probably at about 23.00 hours, the after part sank. The second engineer managed to hold on to a ladder which had floated towards him until he was picked up by the "Durham Trader" in daylight on the morning of the 6th November. He was, by that time, in an exhausted condition and could only be brought on board with the assistance of the bosun of the "Durham Trader" who had courageously jumped into the water to secure a rope around his arms and legs. The remaining 8 persons on the after part of the "Clan Keith" lost their lives. (3) before leaving the forward part of the "Clan Keith" he failed to take any steps to summon assistance either by sending out distress signals on the portable emergency wireless set or by the use of distress rockets. The Court, in view of the gravity of these faults, and in spite of the master's previous good record, has come to the conclusion that it must suspend his master's certificate for a period of eighteen months from today. The Court also orders him to pay the sum of £100 to the Treasury Solicitor on account of the expenses of the investigation. 16. The Court is not satisfied that the loss of the "Clan Keith" or of the 62 members of her crew was caused or contributed to by the wrongful act or default of any other person. 17. There was evidence that no adequate instruction had been given to the crew in the use of distress rockets and that some of them were not aware that any spare life jackets were available in the bridge structure. The falling away of the forward part of the No. 3 lifeboat, with the consequent loss of many lives, has also caused the Court much concern. The Court recommends that consideration be given to these matters with a view to possible further safety measures being taken in the future. The Court further recommends that consideration be given to the provision of internal air-tight sub-divisions in the main buoyancy tubes of inflatable life rafts. 18. The Court wishes to express its appreciation of the assistance given by those on board the "Durham Trader" and the "Nunnalahti" in the rescue of survivors. Q. 1. By whom was the "Clan Keith" owned at the time of her loss and who was her designated manager? A. Clan Line Steamers Limited of 2 St. Mary Axe, London, E.C.3. William Laurence Woof of 2 & 4 St. Mary Axe, London, E.C.3. Q. 2. When, where and by whom was the "Clan Keith" built? A. 1942. Richmond, California, U.S.A. Todd California Shipbuilding Corporation. Q. 3. 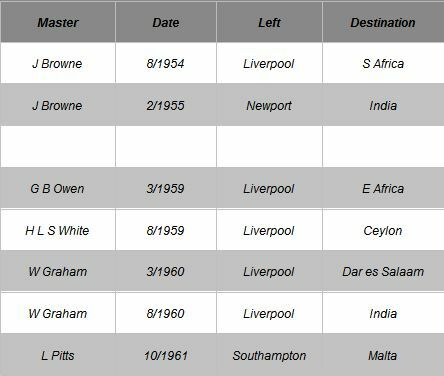 Did the "Clan Keith" leave Southampton on 28th October, 1961, bound for Malta under the command of Captain Leslie George William Pitts and did she carry a crew of 68 hands all told? Q. 4. (a) With what type of radar was "Clan Keith" fitted and on what range scales could this set be operated? A. Quo Vadis type 1418 one, three, ten, twenty and forty miles. (b) Was the radar set in good working order at the time of the casualty? Q. 5. (a) What other navigational aids were provided on the "Clan Keith"? A. Direction Finder, Marconi type 579. Echo Sounder, S. G. Brown Limited Type 655. (b) Were the said navigational aids adequate and properly maintained in good working order at the time of the casualty? A. Yes, as far as is known. Q. 6. Was the "Clan Keith" supplied with all necessary navigational information? Q. 7. What radio apparatus did the "Clan Keith" carry and was it adequate and properly maintained in good working order at the time of the casualty? A. Main Transmitter, Marconi Oceanspan. Receiver Type CR300/20. Emergency Transmitter, Marconi Salvor. Receiver, Marconi-Alert. Lifeboat Portable Transmitter, I.M.R. Solas. Auto Alarm, Marconi Vigilant. The ship was also fitted with an automatic keying device. It was adequate and properly maintained in good working order. Q. 8. 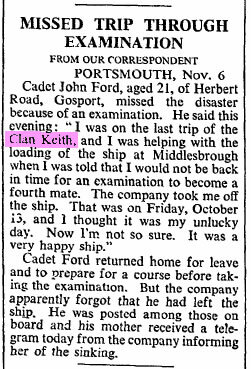 Was the "Clan Keith" in all respects seaworthy when she left Southampton? Q. 9. What was the condition of the weather and sea at 0230 hours on 5th November, 1961 and what was the vessel's position, course and speed at that time? A. North-westerly gale, high sea, short swell. The vessel was in a position with Cap de Fer Light distant 6 miles and bearing 168° and was on an easterly course proceeding at full speed. Q. 10. What alterations were made to her course and speed thereafter? A. Her course was altered to 026° and her speed was reduced. About 2 hours later her course was altered to north and her speed was further reduced. At about noon an easterly course was set and speed was increased to about 9 1/2 knots. Q. 11. Who was the Officer of the Watch from 1600 hours until the casualty on 5th November, 1961? A. The chief officer, relieved for a time by the third officer at 18.00 hours. Q. 12. (a) Did the master go on to the Bridge between 1600 hours and the time of the casualty and, if so, when? A. Yes. At about 16.20 hours. (b) Did the master take charge of the navigation of the vessel between 1600 hours and the time of the casualty and, if so, when? A. Yes. At about 18.30 hours. Q. 13. What was the state of the weather and sea from 1600 hours to the time of the casualty? Q. 14. (a) Did the "Clan Keith" break in two on 5th November, 1961? A. At about 19.10 hours. (c) What was the cause? A. Striking the Ecueils des Sorelles Rocks. Q. 15. What officers and crew were left on the forward portion of the ship after she broke in two? A. The master, the chief officer, the second officer, the third officer, the purser-chief steward, the radio officer, a cadet and two other members of the crew. Q. 16. (a) Were any steps taken to use the vessel's main or emergency radio to call for assistance? A. The aerials had parted. Q. 17. (a) Was the No. 2 port lifeboat launched and who was in it? A. Yes. The second officer, the purser-chief steward and the quartermaster. (b) Why did no others get into it? A. it could not be kept alongside. (c) Were any of those in this lifeboat saved? A. Yes, all of them and also the master who was picked up by this boat. Q. 18. (a) Was the "Clan Keith's" lifeboat radio used to call for assistance? A. No satisfactory explanation has been given for not using it before it was transferred to the No. 2 lifeboat. Whilst this boat was being lowered the lifeboat radio was lost overboard. Q. 19. (a) Did the remaining officers and crew on the forward portion of the "Clan Keith" leave by means of the life raft? (b) Was the life raft damaged after being launched and if so, how? A. Yes. Probably by contact with the jagged edge of the forward part of the vessel. (c) Were any of those who left the vessel in the life raft saved? A. Yes. The master, who was thrown out of the life raft and picked up by the No. 2 lifeboat. Q. 20. In what position and at what time did the forward portion sink? A. About 7 miles west of Cape Serrat at about 0805 hours on the 6th November. Q. 21. How many officers and crew were on the after portion of the ship after she broke in two? A. The chief engineer, the second engineer, the third engineer, the fourth engineer, the fifth engineer, the carpenter, a cadet and fifty-two other members of the crew. Q. 22. (a) What steps were taken to keep the after portion of the vessel afloat? A. See Annex. Paragraph 12. (b) Were these steps proper and adequate? A. Yes, as far as possible. Q. 23. (a) Was the No. 3 lifeboat successfully launched. A. Whilst being lowered its forward part fell away and it was left swinging on the after falls for a time before it fell away altogether. Q. 24. Were any of the persons who attempted to leave the after portion of the vessel in No. 3 boat rescued and, if so, in what manner? A. The third engineer and one other were rescued by the Finnish tanker "Nunnalahti" but only the third engineer survived. Q. 25. (a) After the No. 3 lifeboat had left the after portion of the vessel, how many persons were left aboard? (b) By what means did they abandon the vessel and were any of them subsequently saved? A. See Annex. Paragraph 14. The second engineer was saved; by the motor vessel "Durham Trader". Q. 26. (a) Was the No. 4 lifeboat successfully launched? A. See Annex. Paragraphs 4 and 14. Q. 27. At about what time and in what position did the after portion sink? A. Probably at about 2300 hours on the 5th November. Position unknown. Q. 28. Was the loss of the "Clan Keith" caused or contributed to by the absence of the buoy or the light thereon normally marking the western end of the Ecueils des Sorelles? Q. 29. (a) Was the loss of the "Clan Keith" caused or contributed to by the wrongful act or default of the master? (b) Any other officer or member of the crew? Q. 30. (a) Was the loss of life caused or contributed to by the wrongful act or default of the master?